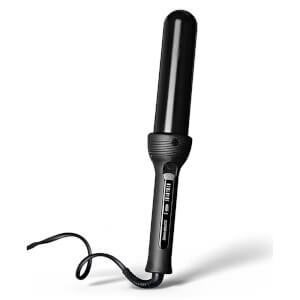 Cloud Nine iron use state-of-the-art temperature control technology, allowing the creation of a multitude of exciting looks without having to use searing heat. Whether you want to smooth, flick, curl or straighten the hair, you can - at a lower temperature than you ever thought possible. The added beauty of less heat is less damage to the hair. Temperature Control: The LED panel gives a clear indication of temperature which you can adjust as you require. Black Ceramic Plates: The special and mysterious ingredient incorporated into the black plates gives your hair added shine and sparkle, each and every time you use your iron. Swivel Cord Unique to Cloud Nine: You can enjoy incredible freedom of movement when styling your hair. Heat Guard: As soon as you're finished using your iron, you can clasp it back together, slip on the protective heat guard and allow it to cool down. Hibernation Mode: This intelligent sleep technology automatically kicks in when the iron has been switched on, but not used for 30 minutes. When in this mode it will cool down to 'box temperature'. RFID Chip: We can track your iron and monitor it to ensure it's a genuine product only sold through authorised Cloud Nine stockists.